AMERICAN FOREIGN POLICY - 3RD ED. 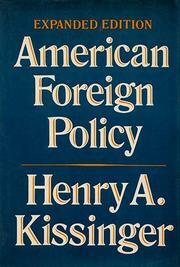 When the second edition of this book appeared in 1974 (it was first published in 1969), Henry Kissinger had only recently become Secretary of State. This new edition contains many of the major policy speeches he delivered in the fob lowing two years, concluding with a July 1976 talk. The selections from this period, which take up most of the book, include addresses covering all major regions of the world; in content they range from general conceptual themes to specific policy proposals. Many speeches are now tinged with irony--the same Henry Kissinger who ordered wiretaps on his staff addresses the American Bar Association on international law--while others, such as the "year of Europe" speech and the UN address outlining proposals for aiding Third World economic growth, are testimonials to lost opportunities and unfulfilled promises. Kissinger's emphasis upon great power leadership in world affairs emerges clearly, as does the fragility of his foreign policy edifice; the speech on the meaning of "détente" appears anachronistic now. The significance of these speeches for an understanding of Kissinger's tenure may change with time, but at the moment, just six months after his departure, they already form an illuminating counterpoint to his actions.